The early history of Leduc saw the development of fire fighting techniques. In the beginning when a fire broke out, neighbors would grab their buckets and form fire-fighting lines by passing the buckets from a water source to the fire. As Leduc grew the community would arrange to purchase equipment to assist the volunteer firefighters. In 1904 the community formed a fire brigade and bought a horse drawn water pump. 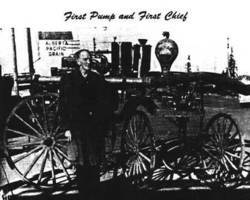 Leduc’s first fire chief was Mr. William J. Craigen and he saw the purchase of the first fire pump. Nearly fifty years later the pump was called out of retirement to help fight the Leduc Hotel explosion and fire in 1950. Over the years the brigade grew and increased both the level and quality of service to Leduc. By 2004 the service had evolved to include an integrated fire and emergency medical service and professionally trained Firefighters, Paramedics and EMT’s. In the early days of Leduc, fires would play a major role in shaping the Leduc we see today. Each fire would result in building code changes or encourage a change in building materials or the purchase of new equipment. Leduc’s early history is dotted with stories about bush and barn fires and the occasional house fires. However there are also disastrous fires that impacted the community. Leduc began as a center for farmers to buy supplies and to send their crops to market so any fire that affected their ability to acquire or sell products had a negative affect on their ability to make a living. Three of the first four major fires in Leduc revolved around the agricultural abilities of Leduc. A grain elevator and Telford’s planning mill and the railroad depot were destroyed by fire. Four major fires in the early history of Leduc had a serious effect on Leduc’s development. The first occurred in 1911 when Leduc’s two-storied school was burnt to the ground. The school had just been renovated when the fire occurred. When the town decided to rebuild the decision was made to replace wood for fire resistant brick. The new school opened in 1912 and would remain as a feature of Leduc until 1965 when it was demolished after being replaced not with one new school but several! Another fire occurred when the railroad station, built in 1891, was consumed by fire in 1914. It had been one of the first depots built on the Calgary & Edmonton Railroad line and would be replaced on the same spot. The third major fire occurred in 1940 when the original Waldorf Hotel was destroyed by flames leaving the community with only one hotel. The fire that would gain international coverage occurred in 1950 when the Leduc Hotel blew up killing ten people. These early events led the citizens of Leduc to realize the importance of fire prevention and the development of laws and services that would hopefully minimized the seriousness of future emergencies. Today Leduc’s Fire Services are among the best in the province. Providing service not only for the city but working in co-operation with other neighboring services the safety of travellers both on the highway and in the air. The tradition of todays Fire Services can be traced back to a time when individuals grabbed a bucket to help their neighbors! You can help todays Leduc’s Firefighters’ attempt to raise money for muscular dystrophy by contributing to the Rooftop Campout for Muscular Dystrophy campaign. Four firefighters are volunteering their time to camp out on the roof of the Protective Services Building (2-4119 50 Street, Leduc) to raise money. This campaign will run Feb. 4 – 7, 2013. Stop by and make a donation!